Publications ONWARD TO THE PAST 02.08.2011. ST.-PETERSBURG EGYPTIAN. THE EGYPTIAN STYLE IN THE ARCHITECTURE OF SANKT-PETERBURG. Sphinxes in St.-Petersburg. ♦ Pyramids of St.-Petersburg. ♦ The Egyptian gates ♦ The Egyptian houses. ♦ Obelisks of St.-Petersburg. In architecture of St.-Petersburg "the Egyptian style" is one of defining and the most mysterious attributes of a city on Neva, sphinxes from university quay became long ago one of the basic symbols of the city on a level with the Peter and Paul Fortress and Admiralty. In XVIII-XIX centuries in Petersburg and suburbs "Egyptian" stylized elements were actively used in mounting of buildings, bridges, interiors of palaces (for example in Pavlovsk , suburb of Petersburg), quays - so the name "northern Thebes" or "northern Memphis", are suitable for Petersburg not less, than "northern Palmira" or "northern Venice". The fashion reflected in the Petersburg architecture on the Egyptian subjects has arisen in Europe after a march of Napoleon to Egypt in the beginning of XIXв. The tradition of "the Egyptian Petersburg" indirectly continued to exist and during Soviet time - erection of tetrahedral obelisks (prototypes were widely used in Egypt of the Average and New kingdom times) and is living till now, an example to it are sphinxes put on Robesper quay in 1995 and also stylized "under Egypt " sculptures near «Pyramid"club and some other institutions in city centre... Architecture is an art not so much graphic, but expressive. And if at least fluently to look at the history of architecture it is possible to be convinced that there is no and can not be a creation of the original architect which will not bear of a certain idea in itself. Sphinx is a monster with a head of person and a body of quiet laying lion, a mind and force combination. Its history begins before some millennia B.C. and goes back to sources of Ancient Egypt culture and art. The most ancient inhabitants of the Nil's valley believed, that born by their imagination and modeled by them the stone sphinx was allocated not only by mind and force, but powerful spirit could be installed in it that malicious demons were afraid. Therefore, quite often near an entrance to a temple or to a palace of the Pharaoh stone sculptures established in pairs considering them reliable guards from evil spirits . With flow of time they began to attribute force and power of gods to sphinxes. Then, when Pharaohs have found the unprecedented power and power, sphinxes have been started to represent with a head of Pharaohs, with attributes of the imperial power: a crown, a kerchief, a sacred cobra, a necklace. Sculptures became not only by image of the reigning Pharaoh, but also by symbol of its boundless power, by embodiment of inhuman power. Egyptians named a sculpture of a humanoid regal animal "mister", "lord". The word used by us now "sphinx" is Greek origin one and in translation into Russian means "suppressor" In imagination of ancient Greeks the sphinx was a female being, and its strange appearance myths explain so: fantastic Chimera, a demon with a head and a neck of a lion, body of a gout and tail of a dragon has accrued from snake-like monsters Tyfon and duckbill having three head (a lion, a goat and a dragon). The Chimera and two-headed dog Ortr have given birth a daughter Sfingu (sphinx) a malicious demon in female image. That is why in an ancient art the sphinx was represented with a head and a breast of woman and a body of lion, a winged lion with a head of woman and snake's tail or a lion with body of woman, eagle wings and claws. Myths tell, that the Sphinx lived on a rock near Thebes and, trapping of travelers, gave those smart riddles. Nobody could guess them, and the blood-thirsty fright smothered and devoured defenseless victims, directing horror on Thebeses and the neighboring lands. Presently the word "sphinx" means allegorically "riddle"," the mysterious person ". Among a various monumental and decoration sculpture of St.-Petersburg there are different sphinxes; the greatest art and a historical value is represented by two granite sculptures from ancient Thebes. In the twenties of the last century around ancient Thebes Frenchmen under the guidance of scientist G-B Shampolon made archeological excavations, and the first an interesting find taken from under a centuries-old layer of sand was a pair of perfectly remained granite sphinxes. The history of the Petersburg sphinxes begins since this moment, as a matter of fact, and until now decorating landing stage on Neva before a building Academy of arts. This history is reduced to the following. One of the dug out sphinxes has been sent to Alexandria where it has been seen by A.N.Muravev, the young Russian officer and the traveler he has seen and has lighted up with desire to get ancient Egyptian sculptures for Russia. But statues have been estimated in 100 000 francs, and for their purchase it was necessary to receive Nicolay’s I permission .While Muravev's letter informing about a rare find has reached Petersburg ,while has been reported about it to the tsar, and he has passed it to the Academy of arts, while Academy council has approved application of Muravev , while a necessary paper has caught up of a travelling tsar and he has imposed the definitive resolution , stone sculptures hardly France has not bought. And sphinxes would not stand on the Neva's landing stage, if was not July revolution. French government could not make purchases of historical values, and here, not delaying any more, Russia has bought sphinxes for 64 000 roubles bank notes. By the sailing ship "Kind hope" they have been delivered to Petersburg and in the end of May, 1832 they have been placed on the Round court yard Academy of arts. Two granite sphinxes , found at excavation of ancient Egypt capital - Thebes, have been established in 1834 on quay of Neva near a building Academy of arts. On pedestals the inscription is cut: the Sphinx from ancient Thebes in Egypt is brought to Sacred Peter's city in 1832. In the same place closer to water, two sculptures of winged lions which many people wrongly name griffins are established. Lions have been cast from bronze at Kolpino factory. In the end of 19th century they have completely disappeared. In 1958 Soviet architects I.N.Benua and A.Е, Polyakov on the basis of the remained archival documents and old illustrations have made the project of restoration of the lost sculptures; models were executed by the master of special scientifically-restoration industrial workshops G.F.Tsygankov, and their casting in metal was made in foundry workshop Academy of arts. The Egyptian bridge over Fontanka through which Lermontov prospect passes guard four cast-iron sphinxes. The bridge existing nowadays reminds a little former Egyptian which was cantilever bridge, chain .These chains passed through high cast-iron gates with many ornaments made in the Egyptian style. In 1826 after finishing of bridge building on both its parties on pedestals have established four sphinxes of work by sculptor P.P.Sokolov. In January 1905 the bridge has fallen under weight of a squadron of horse regiment passing on it. Later 50 years on a place of the old bridge has been constructed the new one. Though the bridge also is called as Egyptian, sphinxes which guard it difficulty to call the Egyptian. Thoroughbred Egyptian sphinxes were represented with men faces. But not female. The stylized shape of sphinxes at the Egyptian bridge with a high gilt crest of a headdress and a flexible strong body reminds the Greek sculptures more likely. Still the pair of the same sphinxes of P.P.Sokolov decorated quay of small Nevka on Stone Island. Only destiny of them is tragical. Initially these sculptures have appeared unnecessary, superfluous. They have been cast by the first and represented trial specimens. For any reasons they did not satisfy experts and after these sphinxes have appeared four ones more. They guard the Egyptian bridge. For sculptural group initially was required four sculptures, and third pair has appeared superfluous. It has been taken literally from a dump, according to some information, one sculpture stood for a long time in the yard of an inhabited house in Mozhaiskaya Street. In December, 1971 sphinxes have laid on parapets of landing stage of quay small Nevka at the Kamennoostrovsky bridge. They entered in a landscape not bad, however, have not found rest. Statues have occupied low granite curbstones practically on a water level, under feet. As a matter of fact, they stood in the river and once, it is possible to say, even floated along it during inundation when pedestals have disappeared under waves of small Nevka . There was this inundation at night since 28 to 29th, December, 1975, and it was not the last. Have outraged upon them and vandals. Homebrew barbarians were not frightened by legends that initially sphinxes carried out security function guarded tombs of Pharaohs namely from encroachments. The condition of monuments plunged in horror. Sphinxes of uncertain colours stood speckled by markers and paint; broken, spoilt a diadem has been sawn off from one of them. On their backs some people drank alcohol which walks on Stone Island of a known place of city amusements. Then sphinxes have been removed for restoration after which have been established already in an other place. In Polyustrov sphinxes have lodged at a source of mineral water in the end of XVIII century, but at building have disappeared. In 1958 they have been again created and established at landing stage on Sverdlov quay. Built in the form of an extensive terrace, the landing stage has two platforms: bottom, serving by a mooring, and top, specific from which it is possible to admire by panorama of Neva; last is at the level of quay and is some kind of a roof of a rectangular ledge. The specific platform is square in the plan from three sides is protected with a low shod lattice, and in corners is strengthened with stones which simultaneously serve as pedestals for two sphinxes. Sculptures are turned to each other, and their profiles are clearly visible on phon of the river and the sky. Stroganovsky palace is remarkable creation of the outstanding architect in the middle of XVIII century V.V. Rastrelli and one of the best architectural monuments of blossoming period of Russian baroque. It was under construction since 1752 till 1754 for the richest Elizaveta's grandees S. G.Stroganov 1. The magnificent palace with its external appearance, decorating and furniture of internal premises underlined riches of its owners. At doors of the former main entrance on low pedestals two sphinxes lay from grey granite in size more than meter. Shape of sphinxes is female. And again imperturbably quiet pose, cold indifference of the lifeless face and an aloof sight presents. The kerchief, falling with ends on a breast, frames the person. An equal smooth surface of kerchief recover narrow, it is longitudinal going grooves. Shoulders and a back are covered with a fabric. The form of a lion's body and claws are generalized, poorly designated. The history of sphinxes originates in the end of XVIII century and is connected with A.N.Voronihinym's construction for the count A S.Stroganov of a magnificent country summer residence on the bank of Big Nevka. From a mooring the wide ladder conducted on landing stage which was decorated with statues of two granite sphinxes. They were the first sphinxes on time, appeared on quays of Petersburg. After them two more pairs the same granite sculptures have decorated landing stage before A.A.Bezborodko's country summer residence. It is possible to assume, that all of them have been modeled by the same sculptor which name remains unknown . In 1908 Stroganov's summer residence has been reconstructed, and sphinxes after some "wandering" have got on their present place. Absolutely original sphinxes are in a court yard of the Leningrad mining Institute. The court yard middle is occupied with a small old garden with the lawns, with densely expanded bushes and trees. From a gate there is a straight avenue on sides of which stand massive cast-iron vases in the form of antique altars smoke-vase on powerful lion's paws, with relief ornaments in the form of the mutton and goat heads and in the depth of avenue there are two sphinxes and a stone bowl with flowers between them. Statues are insignificant, established without pedestals, but thanks to black colouring are sharply allocated on phon greens; absolutely identical, they have saved well. Their faces are expressive and noble. The building of the mining Insnitute itself has been reconstructed from small houses earlier standing on its place under A.N.Voronihin’s project. The monumental building with powerful twelve-column Doric portico is erected in 1806- 1811. Model according to which sphinxes were cast in metal the sculptor has made which name while also documentary is not established though it is known that in building design took part V.I.Demut-Malinovsky and S.S.Pimenov. Sphinxes changed their place not one time; in the summer of 1966 they have put in square them. In 1807 under A.N.Voronihin's project the fountain-grotto on northern slope of Pulkovsky mountain, and in 1809 three fountains of the architect of Tom dе Тоmоn, remained till now are constructed. One of Tomon's fountains represents big enough construction in the form of open pavilion from blocks of grey granite. On a high socle stand four Doric columns supporting pediments and a dome between columns the graceful bowl from the polished stone is placed. All construction is protected with a parapet in height about meter. Two pairs of granite sphinxes modeled on one model are based upon a parapet from highway profiles of two statues turned into opposite sides are clearly visible. Sphinxes have female shape they remind the statues of sphinxes which are situated in a court yard of the Stroganovsky palace and are created approximately during same time. Originally the fountain served as a road ornament if eminent travelers stopped at Voronihin's grotto to satisfy thirst with spring water near Tomon’s fountain the drivers gave to drink to horses. The smallest sphinx (it lives since 1832 at crossing of the Neva prospectus and Garden street on a building of the Russian national library), for certain, overwhelming majority of townspeople did not see not speaking about visitors of Petersburg. It sits on a helmet of the goddess of wisdom Minerva which is on the main facade of a building. The sculptor is Vasily Demut-Malinovsky. These are the youngest sphinxes in St.-Petersburg they have been established on quay Robesper on April, 28th, 1995, as a monument to victim’s political terror and reprisals. Sphinxes of Michael Shemjakin's work have two different profiles. If you look from one side and see traditional female profile which is turned to houses on quay. And from another one instead of the person you see the bared bones of a skull. On pedestals of monuments are put citations from Vysotsky , Solgenicyn, Zabolotsky and other authors of 20 century, adjoining to a theme of political reprisals. Special legends about these "beasts" while there are no. But someone asserts, that they ostensibly help injustly got for a lattice prisoners to come back home. The most known is the tetrahedral granite pyramid which is situated near Palladiev bridge in Tsarskoe Selo. A pyramid is characteristic enough for its epoch of park construction. It is constructed in 1770-1771 by an architect V.I.Neelov. Initially the pyramid was intended for a burial place of favorite doggies of Empress Catherine II. In 1773 in pyramid corners four columns, hewn out from marble have been established. The pyramid has been erected from a brick and revetted square granite. In 1782 it has been disassembled and built up anew in 1783 by an architect Ch.Kameron. In the beginning of XIX century a pyramid named Egyptian. Entrance located in its facing side, leads into the internal premise blocked with a spherical dome. Here in wall niches the collection of antique urns and vases has been placed. Perhaps, the most original temple of Petersburg is a Troitskaya church near to metro "Proletarskaya. ", people say - "the Easter cake and Easter" as its the forms remind a round Easter cake and pyramidal cottage cheese Easter. The temple is obliged with this originality to its customer the general -public prosecutor prince Alexander Alekseevich Vjazemskij an owner of village Aleksandrovskoe which was on the left bank of Neva in 10 versts from Petersburg. Here he has begun a construction of the extensive farmstead house and has made a park in which centre the prince has decided to erect a temple. Embodiment of idea he has charged to an architect N.А. Lvov. Church construction was conducted in 1785-1787 for Catherine II money. The church name - "the Easter cake and Easter" is explained of its appearance. Actually the architect put more refined sense in his creation. The customer of church the prince Vjazemsky served as the general -public prosecutor, i.e. in justice department. According to plan of the architect the rotunda symbolizes a justice temple and "firm prismatic pyramid" - Three virtues": Trues, Philanthrophy and Conscience. The church itself represents a round construction in the form of rotunda, captured from different sides with a colonnade from 16 columns of Ionian warrant and topped with a flat dome. Separate details of architectural registration of a facade (oval windows of 2nd circle, the capitals decorated with garlands) are characteristic for early Russian classicism. The temple belfry has the form 4-sides pyramid which has been cut from 4 sides with arches for bells. On the first circle of a bell tower is located christening place (the bell tower itself is for some reason upholstered with iron sheets). Inside there is a round hall of the temple which height is equal to diameter it is decorated with the Corinthian pilasters supporting a wide belt entablature over an aperture altar apses there are figures of soaring angels. However, similar church type effective enough outside has appeared inconvenient for orthodox divine service because it almost did not remain places for an altar. Therefore, in 1858 it was necessary to attach a vestry and stone vestibule to rotunda having brought the essential amendment to a plan of the architect. Since March 1938 temple which was under protection "as the monument of all-Union value", stood closed, being used as a club, but in spring 1946 has been put into the order and since April, 17th is opened for divine service. Architecturally-sculptural gravestone is over a tomb of the opera singer, the main director of Mariinsky theatre, the professor of Petrograd conservatory Tartakov Ioakim Viktorovich (1860-1923). Architect I.A.Fomin. The gravestone is executed in the form of a six-step pyramid, on the rectangular pedestal supported with four bronze akrotеrion in the form of theatrical masks, on profiled a massive socle. In the pyramid North side is a square cartouche with bas-reliefic profile of Tartakov in southern in a figured cartouche the inscription is cut down: DESERVED/ACTOR/I.V. TARTAKOV In the capacity of material for the pyramid has served pink sandstone taken from a socle of the winter palace fence disassembled in that time. Pyramid is on a wall of a tomb Beloselsky-Belozersky. A sculptural gravestone (1810), sculptor Z.Kamberlen, an architect ZH.-F. Toma dе Тоmоn. Prince Alexander Mihajlovich, the valid privy councilors (with 1801), the chamberlain, the senator (since 1796), the diplomat and the writer, the collector of the fine arts (by the end of his life the collection was considered as the best in Russia). He is awarded with St. Alexander Nevskij award. The honorable member of the Petersburg Academy of sciences (1800). He was one othe most educated people of his time, the patron of art among artists and writers. Translated into French M.V.Lomonosova, G.R.Derzhavin, I.S.Barkov products, had works on music and art. In Petersburg there are a lot of pyramid images which are put on architectural monuments, temples, gravestones and even over an icon of Maiden Maria in the Isakievsky cathedral. Here are little the most known. Sampsonievsky cathedral. An eye in a pyramid. The big Sampsonievsky avenue 41. A pyramid in beams on a facade of Znamenskaya church in Tsarskoe Selo. Now this pyramid does not exist any more. Pyramid in beams, and an all-seeing eye inside on the Alexandria column. The pedestal of a column from four sides is decorated with bronze bas-reliefs with ornaments from military armour, and also allegorical images of victories of the Russian weapon. Separate bas-reliefs represent Old Russian chain armours, spiked helmets and the boards stored in the Armory Museum in Moscow and also Alexander Nevsky’s helmets and ones of Ermak. The granite monolith which has formed a basis for creation of a column has been extracted in one of open-cast mines near Vyborg and transported in 1832 on barge specially designed for this purpose to St.-Petersburg where has undergone to the further processing. In 10 minutes of walking from Catholic Church on crossing of Kuzminskaya Street and the parkway making a border of a city there are Kuzminsky (Egyptian) gates. Behind them begins a village Kuzmino occupied by descendants of those «переведенцовъ» from palace villages which have been caused by Peter the Great for colonization returned to them Russian lands. With hands of ancestors present Kuzmichs all Tsarskoe Selo was under construction. The Egyptian gate are constructed in 1827-1830 under the project of an architect A.Menelasa. Two stone guard houses of gates reproduce the form of Egyptian pylons, narrowed up. They are topped with beautifully bent massive eaves cast from cast -iron. Fillets of eaves are decorated with images of a scarab with a solar disk and two snake heads. Planes of walls of guard houses are revetted with cast -iron plates with relief images of various scenes from mythology and a life of ancient Egyptians. Bas-reliefs are located in six rows, and the height of each subsequent row is less, than previous. Walls guard houses adjoin to monumental cast -iron germs. Similar germs but bilateral, served as support of gate. Casting of all elements of gates was made on the S.-Petersburg iron-factory. Drawings of reliefs were full-scale executed by artist Vasily Dodonov. He used in his work graphic materials of the multivolume edition published in the beginning of XIX century in Paris and devoted to results of researches of the French scientists, accompanying Bonaparte in his Egyptian campaign. Models of bas-reliefs and germs were molded by sculptor V.I.Demut-Malinovsky. All the models have been executed within spring and summer of 1827. In the course of building a granite socle have replaced with a socle from cast -iron plates over which plates with hieroglyphic images were established. The internal space of pylons is divided by overlappings into three floors. Premises are shined with the small windows equal on height to one row of bas-reliefs. In 1941-1944 heavy damages have been put to gates. The part of cast -iron plates has been broken with splinters of shells. In the process of gate's restoration the damaged parts of facing are cast anew. Decor elements of "The Egyptian gate"
Photo from a book "Monuments of architecture of Leningrad, suburbs. "Monuments of art of the Soviet Union. Leningrad and vicinities. The directory-guidebook" (N.S.Alyoshin). In 1911-13 under the project of an architect Songajlova in Zaharevsky Street the profitable house Nezhinsky more known today as «the Egyptian house» has been built. The building facade partly reminds a main entrance into a temple of goddess Hathor in Denver, despite of obvious congestion with details. With faces of the heavenly goddess of love, the sovereign of four parts of the world, are decorated capitals of columns. Columns themselves are stone similarity систров - the musical instruments similar to rattles which sounding, according to temple texts, is called to revive the Universe. Faces of goddesses on capitals strongly enough differ from the Egyptian originals and, more likely, remind separate sculptural portraits of Phoenician art. However, as a whole, the architectural plan of the house is excellent. In the facade centre the arch is located through which goes passage to the courtyard. The graceful lattice, for some time closing an arch and practically destroyed, has been executed in the form of stalks of lotuses over which the winged solar disk rises. Over an arch the decorative balcony is located also with the sculptural image of Hathor face. From two sides of an arch pass two symmetric parts of facade decorated already mentioned with Hathor columns. A massive facade is flanked with two entrances at the doors of which stand the enormous imperial pilasters imaging of Pharaohs in short loincloths, compressing in the crossed hands symbols of an eternal life анх. These monuments, perhaps, are the best imitations of the Egyptian sculptures in Petersburg, despite of rigidity alien to the Egyptian culture in modeling of regal faces. On their heads there are nemes, decorated with horns of sacred ovens uraeus, symbolizing the Supreme power, and with solar disks. Elements of the Egyptian style meet and in the registration of apartment houses. In particular, the house 31 in Zverinsky Street and the house 65 in the Petrograd party along Bolshoi prospectus are decorated with the Egyptian decor. Interiors of this entrance are obviously cast by interiors ancient Egypt tombs... Zverinsky .31. Symbols of the god of Sun Rа over an input. Zverinsky 31. They also are in other execution. The Bolsoi prospectus 65. The obelisk is a monument narrowed up it was the important element of ancient Egyptian architecture. The Egyptian obelisks are monolithic, cut from a homogeneous block of a stone. They were established in pairs on the sides from an entrance into a temple. From an inscription at bottom of obelisk Hatshepsut in Кarnak it is known that on it cutting has spent seven months. All four sides of the Egyptian obelisks were covered with the hieroglyphs glorifying god Ra and Pharaohs. Egyptians, as a rule, gave to the top of obelisk the pyramidal form and covered it with electrum, alloy of gold with silver. St.-Petersburg as not any other city is rich in similar monuments. In the city and in its vicinities it is possible to find many embodiments of ancient Egyptian architecture. The Alexandria column has been erected in 1834 in the centre of the Palace area in St.-Petersburg by architect Ogjust Rishar Monferan by request of Emperor Nikolay I in memory of a victory of his elder brother, Emperor Alexander I over Napoleon. Original project of Monferan creation of a granite obelisk has been rejected by Nikolay and, as a result, Monferan has created a monument which was a huge column from pink granite, standing on a square pedestal. The sculpture of Orlovsky work, representing the gilt angel with the person of Emperor Alexander I crowns a column. In the left hand the angel holds a cross, and right one upraises to the sky. To the left from Academy of arts near to the Petersburg sphinxes the Rumjantsevsky (Solovyovsky) garden arranged on a place of a parade-ground of the Nikolaev cadet school has settled down. In the square centre there is one more Egyptian symbol a monument-obelisk from the grey Karelian granite, established in honour of victories of the Russian weapon in Russian-Turkish wars of times of Catherine the Great times. The monument is located in the central part of park Monrepo, at the top of a steep coastal rock. The monument in the form of obelisk on pedestal with a two-level socle has been made of grey-green marble, under the project of English architect Charles Hitkot Tetam (1772-1842) in a workshop of Swedish sculptor Eric Goethe (1799-1838) and the monument is established in Monrepo in July, 1827. Monument is devoted to memory of brothers of wife Paulja Nikolai brothers serving in Preobrazhenskiy and Semyonovsky Guards regiments and died in battles in epoch of Napoleonic wars. In Russian history the name of this person ranks with Nakhimov and Makarov. The general-major Poman Isidorovich Kondratenko has become famous for that throughout ten months headed defiance of the besieged Port -Arthur during the Russian-Japanese war in 1904-1905. This name should be especially dear to inhabitants of the Irkutsk area, because many of us are straight descendants of Port Arthur heroes. The basis of a fortress of garrison was made by the East Siberian regiments and divisions. The idea of obelisk construction has arisen from Paul I during his travel across Europe 1782-1783. During a visit to prince Konde in his residence Shantiji near Paris on Paul has made impression similar ensemble with obelisk, erected in honour of Duke Anna Monmoransi konnetable. Complex building has begun in 1793. On a hill near to the Big Gatchina palace the area enclosed with a parapet from pudostsky stone in which centre towered the 32-metre obelisk revetted with chernitsky stone has been built. The master mason and builder Kirjan Plastinin was engaged in building. The obelisk has been finished already by the end of October, 1793, also have been made a parapet with extent more than 450 meters and guard-house (has not remained). Around the obelisk 4 stone curbstones connected with chains have been established, in parapet embrasures 6 artillery tools were established, and divisions of the improvised clocks are put on a parapet, hand for which was the obelisk shade. In three years the area has been increased, and it has accepted the modern sizes. In memory of explosion victims on Aptekarsky Island the flower bed has been made and on August, 12th, 1907 Peter Stolypin has personally put in pawn the first stone of the future monument. In 1908 the obelisk in height more than 5 meters with names of all victims and an icon of Revival Christ has been established. The treasury has allocated for these purposes 4500 thousand roubles, and in time of monument opening was Peter Arkadevich and members of his family. Obelisk to memorable flooding on the river Mojka. Such name has received an original monument constructed at a vertical granite wall, dressed the banks of the river Mojka at the entrance on the Dark blue bridge. The high granite obelisk is topped with a bronze trident of the Neptune and a tape fluttering on it with building date. In the top Part of the obelisk there are three granite boards with dials and gnomes (arms, the shade showing solar time) of sundials. Below,begining from a mark in 5 meters, on the obelisk edge the decimeter scale is cut down showing height of water boundary from a normal level and marks of the most memorable flooding - 1824, 1903, 1924, 1955 and 1967. Level of these flooding is designated with bronze tapes surrounding an obelisk, with the dates cut out on them. Height of an obelisk from water boundary is 10 meters. It is constructed under the project of architect V.A.Petrov and engineer P.F.Panfilov. 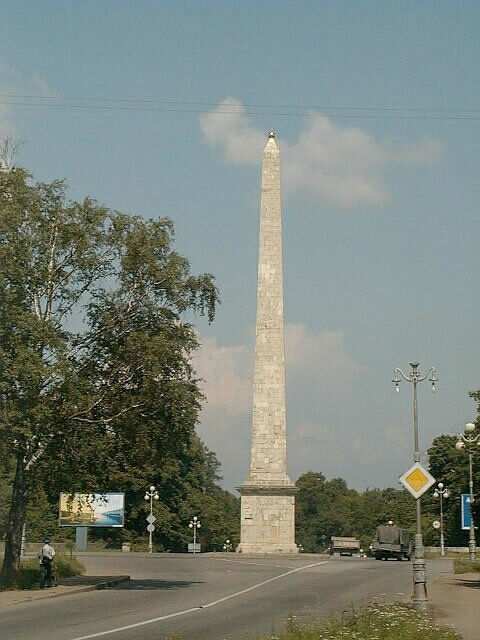 Kagulsky or the Rumjantsevsky obelisk is built under the project of architect A.Rinaldi in 1771 - 1772 in honour of a victory of Russian armies on the river Kagul. About it informs an inscription on a pedestal: "In memory of a victory at the river Kagule in Moldova on July 21 1770, under leadership of general , count Peter Rumjantsov the Russian troops with number of seventeen thousand has put to flight up to the river Danube Turkish vizier Galil-Beja with number of 150000". There are no military attributes in decor of the Kagulsky obelisk. Expressive and strict greatness gives to it beauty of a silhouette, refinement of the proportions, skillfully selected dark grey and red Russian marble. The monument is near to a southern facade of the Ekaterina's palace, near Own garden. In 1887 at mourning meeting on a duel place, devoted to the 50 anniversary of tragical event, the decision on construction of a monument which, however, has not been realized was accepted. There was a necessity, somehow, to fix a duel place of A.S. Pushkin to which danger threatened in connection with building of vegetable storehouse outlined here. On the initiative of the Pushkin society and architecturally-building department of Lensovet and under E.I.Katonin’s project has been made a monument in form of the cracked column from granite and marble. In 1937 by one century from the date of Pushkin's death which was widely marked in the USSR, the column was replaced with granite obelisk created under the project of architects A.I.Lapirov and E.I.Katonin, with a bronze bas-relief of the poet of sculptor M.G.Manizer work . The Chesmensky obelisk is erected under the project of architect Rinaldi. Thanks to successfully chosen place the obelisk is excellently visible from apart and reminds a beacon towering over a small bay. Obelisk's height is 13, 4 meters and if in a distance it seems monophonically light but closer to it is possible to make out, that Rinaldi, erecting the obelisk with taste has selected various shades of stone. The obelisk is put on smoothly rounded off cape of White lake in memory of a victory of Russian fleet under Chesma in 1770. It is the tetrahedral marble spike expanded below, intercepted with corbels, gradually pointed, standing on the basis from red and ruskealsky marble. The refined portrayal of obelisk silhouette its movement upwards, connection contrast in granite and marble invoice, but relatives in colours shading , indissolubility with landscape reveal handwriting, characteristic for Rinaldi. In 1985 by 40 anniversary of a Victory in a Patriotic War an obelisk in the centre of Revolt area has been put. This place was empty many decades after the monument to Alexander III has been taken away from here. The obelisk represents a powerful granite monolith with weight 240 tons, cut in the form of the faceted bayonet topped with a gold star. 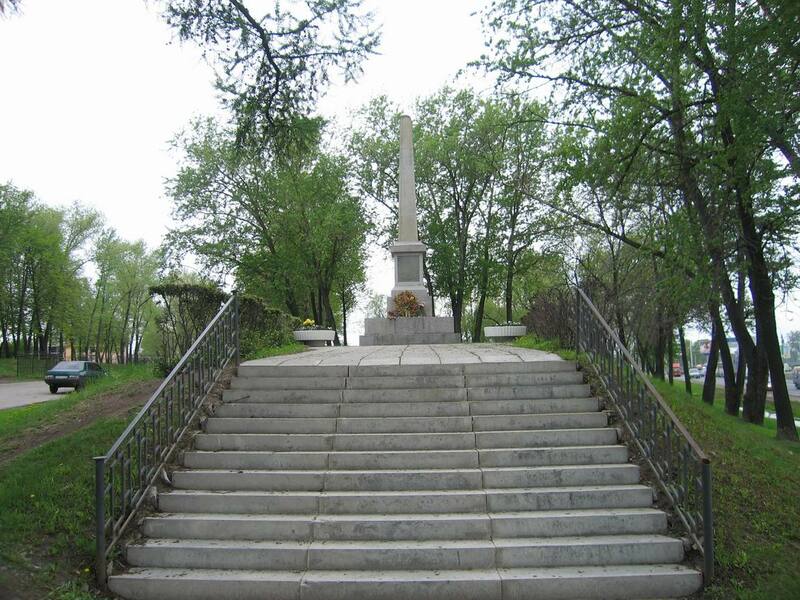 At the bottom part the obelisk is surrounded with a wreath of Glory with bas-reliefs on theme of Leningrad defiance. Authors of the monument "the Hero-city Leningrad" - architect A.I.Alymov and V.S.Lukjanov, bas-reliefs are created by sculptors A.S.Charkin, V.D.Sveshnikov, B.A.Petrov and A.A.Vinogradov, an architecturally-building part of the project by V.M.Ivanov and B.N.Brudno. In spite of the fact that Vvedensky cathedral was registered under state protection as an architecture monument, in 1933 the building has been taken down and on its place the square is arranged. Now on a place of cathedral chapel restaurant "McDonald's" building is constructed. On the initiative of public association of war veterans and of the Admiralty administrative area, according to the order of St.-Petersburg governor from May, 05th, 1998 №390-r "About establishment of memorable signs on place of the lost cult constructions", the decision on a place of the destroyed temple to establish a memorable sign was accepted. Its solemn opening in Vvedensky square on the zagorodnyj prospectus on June, 1st, 2003 has taken place. The project of a memorable sign has developed a group of authors, architects are N.N.Sokolov, S.L.Mihajlov, I.V.Verzhbitskaja, and a sculptor is A.G.Dema. The memorable sign represents a composition consisting of two elements: bases in the form of a column and a base part, in the plan it is an octahedron. The column of the grey polished granite executed from the uniform block has height of 6, 3 m; it is topped with the metal gilt cross. Height of all construction is 11, 7 meters. At column foot is block with the truncated angular elements. On front projections of the block four cartouches are located. The Troitsky Bridge is one of the most beautiful Petersburg bridges over Neva. The bridge connects the Suvorovsky area before the Mars field and the Troitsk area (the Petrograd party). Behind the bridge the Kamennoostrovsky prospectus begins. The bridge has received the name from the Trotsky cathedral destroyed in 1932. Registration of the bridge is on one hand the majestic imperial style which has been put in pawn at designing, on the other hand is expression of architectural and engineering standards on boundary of centuries. Symmetry and a rhythm of design are diluted a little with opposition of granite obelisks framing entrance from the right bank and three-spanned stone stockade on the right bank. Opposite to the Andreevsky cathedral, closing a foot zone, there is an 8-metre obelisk in honour of the 300 anniversary of Sacred Apostle Andrey Pervozvanny award, opened on June, 8th, 2001. Architects are Kazankov A.A.and Sitnikov Award of St. Apostle Andrey Pervozvanny is the first Russian award founded by Peter I in 1698. But here is discrepancy in texts of inscriptions on the obelisk there are two essential errors. The obelisk has been opened together with Foot Street on June, 8th, instead of on May, 27th (as they have hastened to specify on a monument). The obelisk is opened in 302 years after establishment of Andrey Pervozvanny award but in the first inscription on it a wrong date of award establishment is stated 1720. On an obelisk it is cut out: "On this boundary on September, 18th, 1941 heroic defenders of Leningrad have stopped the German hordes and have occupied indestructible defiance". It stands on the bank of river Dudergofka, near to the Ligovsky overpass and prospectus National Home guard. Here passed "the Kirov shaft» of city defenses. The Egyptian mysticism of St.-Petersburg strengthens also circumstance that the city is located practically on a meridian of the Great pyramid with a deviation from it only in 30 km, and on width of 60 degrees. If to take approximately the Great pyramid is located on 30°N 30°E, and Petersburg on 60°N 30°E. If to speak precisely co-ordinates of Alexandria column are on 59°56 ' 20.78 N, 30°18 ' 56.83E and co-ordinates of the Great pyramid are 29°58 ' 45.08N, 31 ° 8 ' 3.60E .More in detail about an arrangement of St.-Petersburg you may read in the article «Peter the Great Code». The Egyptian mysticism of St. Petersburg strengthens also that circumstance that the city is located practically on a meridian of the Great Pyramid, with a deviation from it in only 30 km, and at width of 60 degrees. If to take approximately, the Great pyramid is located - 30°N 30°E, and Petersburg - 60°N 30°E. If to speak precisely, coordinates of the Alexander Column- 59°56'20.78 "With 30°18'56.83" In, and coordinates of the Great pyramid - 29°58'45.08 "With 31 ° 8'3.60" V.Podrobney about an arrangement of St. Petersburg can be read in article « Peter the Great Code ». One more surprising fact which has connected St. Petersburg with other known ancient construction - temple komplex Tiwanaku in South America is quite recently found. It appeared that Tiuanako, with very high precision равноудалён from the North Pole (joint venture) and the Great pyramid (VP). As distances are equal, the equipotential triangle of the joint venture - Tiuanako - VP is formed. The average line of this triangle, it is its height, passes just through St. Petersburg since it is located at the 60th width, precisely in the middle between the joint venture and VP. This circumstance is possible concerns Peter's persistent aspiration to base the city in this place. The truth for this purpose Peter the Great should know, at least, about Tiuanako's existence and the Great pyramid. In more detail about it it is possible to read in article "SOME FEATURES of DISTANCES BETWEEN SEPARATE HISTORICAL OBJECTS."